At euroCARE IVF, we create loving families by providing advanced fertility services to intended parents who are struggling with infertility. Every detail of the euroCARE IVF program is focused on you — and immersing successful fertility treatments right through to parenthood. 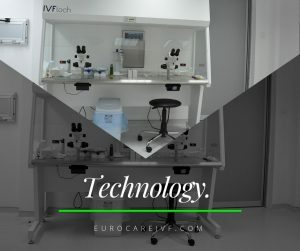 By implementing modernized treatments such as, In-Vitro Fertilization (IVF), donor programs, andrology, and fertility research, the euroCARE IVF team helps future moms and dads to hold on to their dreams of parenthood. Assisted Hatching is a type of ART procedure that involves creating a hole in the zona pellucida (a membrane surrounding the embryo) thereby facilitating the process of zona hatching. Zona hatching occurs when the embryo reaches the blastocyst stage and gets rid of the zona pellucida. Assisted Hatching is used to increase the chances of implantation of the embryo into the uterus. Ideal candidates for Assisted Hatching are patients with previous failed IVF cycles, women who have a thick zona pellucida or in procedures using frozen embryo. Before an embryo can attach to the uterine wall, it must break out or hatch from its outer layer — its membrane, the zona pellucida. Sometimes, due to the age of the oocyte (egg) provider, freezing stipulations, or other factors, the membrane thickens and the growing blastocyst is unable to break out. In such situations, Assisted Hatching may be performed. Assisted Hatching is a micromanipulation procedure in which a tiny hole is made in the zona pellucida. This is achieved to assist the embryo to hatch — further increasing the chance of pregnancy. This membrane holds the blastomeres together, and during natural conception, it helps prevent premature implantation in the fallopian tubes. Typically, it disappears near the blastocyst stage as it is preparing for implantation in the uterus. At the top IVF clinic in North Cyprus, assisted hatching utilities laser technology to create a tiny hole. The embryo is then returned to the culture dish to be further incubated or await transfer. Who Benefits from Assisted Hatching? Assisted Hatching has also shown to be beneficial prior to transferring frozen-thawed embryos since the zona pellucida hardens with freezing. Our skilled embryologist will monitor your embryos carefully — and only if required assisted hatching will be carried out (at no extra cost). Due to the precise technique and artistic skills of our laboratory team, assisted hatching only affects the outer layer — and the embryos remain unharmed.